Listing: Volcanic Seven Summits, Ultra-prominent peak Since its official opening in 1977, Mt Kilimanjaro National Park has become one of Tanzania’s most visited parks. Unlike the other northern parks, this isn’t for the wildlife, although it’s there. Rather, coming here is all about gazing in awe at a mountain on the equator capped with snow, and to climb to the top of Africa. At the heart of the park is the 5896m Mt Kilimanjaro, Africa’s highest mountain and one of the continent’s most magnificent sights. 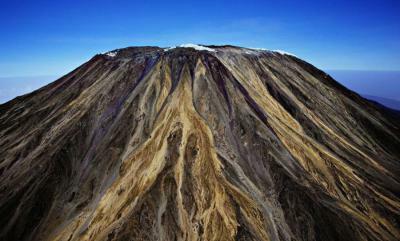 It’s also one of the highest volcanoes and the highest freestanding mountain in the world, rising from cultivated farmlands on the lower levels, through lush rainforest to alpine meadows, and finally across a barren lunar landscape to the twin summits of Kibo and Mawenzi. 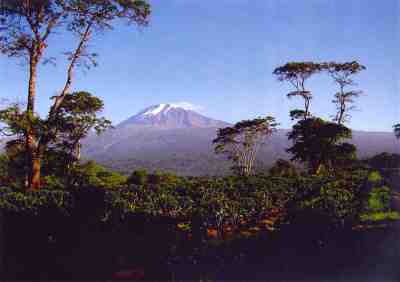 (Kilimanjaro’s third volcanic cone, Shira, is on the mountain’s western side.) The lower rainforest is home to many animals, including buffaloes, elephants, leopards and monkeys, and elands are occasionally seen in the saddle area between Kibo and Mawenzi. A trek up Kili lures around 25,000 trekkers each year, in part because it’s possible to walk to the summit without ropes or technical climbing experience. But don't be fooled by the number of people who climb Kilimanjaro – this is a serious undertaking. While many thousands of trekkers reach Uhuru Peak without major difficulty, many more don’t make it because they suffer altitude sickness or simply aren’t in good enough shape. And, every year some trekkers and porters die on the mountain. Come prepared with appropriate footwear and clothing, and most importantly, allow yourself enough time. 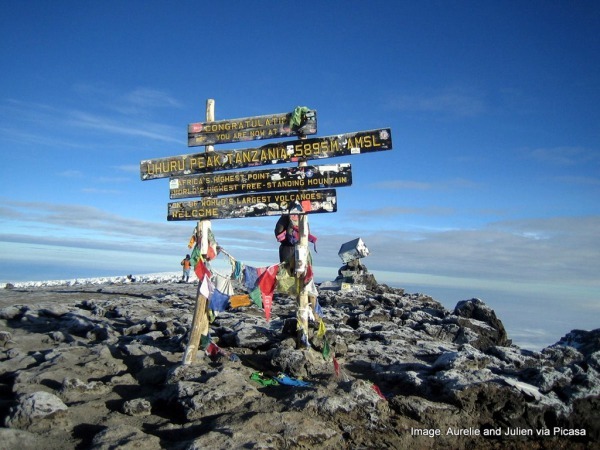 If you’re interested in reaching the top, seriously consider adding at least one extra day onto the ‘standard’ climb itineraries: accepted medical advice is to increase sleeping altitude by the only 300m per day once above 3000m – which is about one-third of the daily altitude gains above 3000m on the standard Kili climb-routes offered by most operators. Mount Kilimanjaro /ˌkɪlɪmənˈdʒɑːroʊ/ with its three volcanic cones, "Kibo", "Mawenzi", and "Shira", is a dormant volcanic mountain in Tanzania. It is the highest mountain in Africa and rises approximately 4,877 metres (16,001 ft) from its base to 5,895 metres (19,341 ft) above sea level. The first recorded ascent to the summit of the mountain was by Hans Meyer and Ludwig Purtscheller in 1889. 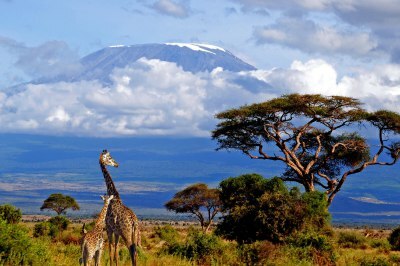 The mountain is part of the Kilimanjaro National Park and is a major climbing destination. The mountain has been the subject of many scientific studies because of its shrinking glaciers. His mountain may have been known to non-Africans since antiquity. Sailors' reports recorded by Ptolemy mention a "Moon Mountain" and a spring lake of the Nile, which may indicate Kilimanjaro although available historical information does not allow differentiation among Mount Kenya, the mountains of Ethiopia, the Virunga Mountains, Kilimanjaro, and the Rwenzori Mountains. Before Ptolemy, Aeschylus and Herodotus referred to "Egypt nurtured by the snows" and a spring between two mountains, respectively. One of these mentions two tall mountains in the coastal regions with a valley with traces of fire in between. Martín Fernández de Enciso, a Spanish traveller to Mombasa, who obtained information about the interior from native caravans, said in his Summa de Geografía (1519) that west of Mombasa "stands the Ethiopian Mount Olympus, which is exceedingly high, and beyond it are the Mountains of the Moon, in which are the sources of the Nile". The German missionaries Johannes Rebmann of Mombasa and Krapf were the first Europeans to try to reach the snowy mountain. 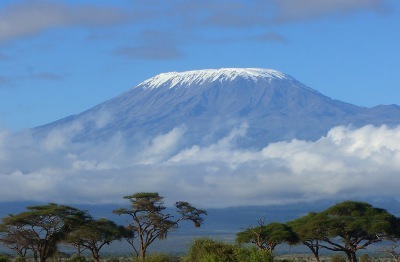 According to English geographer Halford Mackinder and English explorer Harry Johnston, Rebmann in 1848 was the first European to report the existence of Kilimanjaro. Hans Meyer has claimed that Rebmann first arrived in Africa in 1846 and had quoted Rebmann's diary entry of 11 May 1848 as saying, "This morning, at 10 o'clock, we obtained a clearer view of the mountains of Jagger, the summit of one of which was covered by what looked like a beautiful white cloud. When I inquired as to the dazzling whiteness, the guide merely called it 'cold' and at once I knew it could be neither more nor less than snow.... Immediately I understood how to interpret the marvellous tales Dr Krapf and I had heard at the coast, of a vast mountain of gold and silver in the far interior, the approach to which was guarded by evil spirits. "6 In light of these sources, J. Shearson Hyland's assertion that Rebmann first saw the mountain in 1840 appears to be erroneous.